One of our all-time favourite tropical escapes is Tulum, Mexico's beachside paradise in the Yucatan Peninsula. 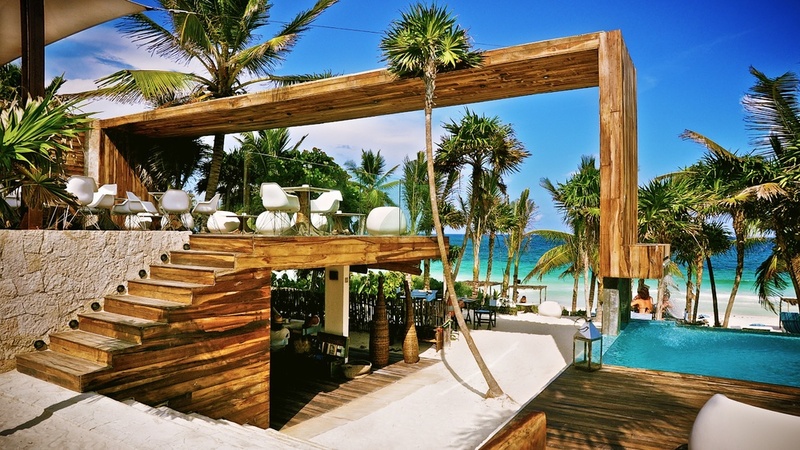 We reveal our Insider's Guide to the best addresses to discover in Tulum. Renowned for its stunning coastal location and laidback vibe, Tulum is Mexico’s answer to yoga, palm trees and Mayan Ruins. Embrace what Tulum is all about by staying in accommodation that reflects the slow pace and idyllic lifestyle. There’s always a place for luxury, and Be Tulum is the perfect tropical hideaway for visitors seeking to switch off and relax. Fringed by jungle and sandy beachfront, there are 20 decadent suites that have been designed to blend seamlessly into the natural surroundings. Lounge by the pool or enjoy traditional indigenous therapies at the on-site Yäan Wellness Energy Spa. For an eco-friendly stay where hammocks and outdoor showers come hand-in-hand, Ahau Hotel is the best bet. Named after the Mayan Sun God, this resort is a bohemian paradise for the earth-conscious traveller. Design is at the forefront of The Beach Tulum, where modern minimalism is incorporated into each guest room. Go superior and you’ll gain access to a secluded roof terrace and a private beach area. Nestled on the white sands of Tulum’s main beach, Nomade Tulum Hotel is a soulful haven for creative nomads, where you can emerge from tranquil earth-toned rooms to enjoy a yoga class, or spend an afternoon in the barefoot serenity of the Spa with its decked walkways, marble hammam and outdoor massage pools. Eco-meets-luxury at Sanara Tulum, a stylish temple to wellbeing overlooking the turquoise Caribbean waters. Meaning ‘You will heal’ in Spanish, Sanara soothes the mind with its world-class Wellness Centre, where healing treatments range from traditional Mayan healing and Ayurvedic massage to clay and mud detox therapies. As Tulum’s “home for thinkers and dreamers”, Casa Malca champions creativity and self-discovery in art-filled spaces that enjoy the cosy feel of a beautiful private villa. The hotel's 35 rooms and suites surround the property’s organic gardens, each one complete with ocean views, rustic furnishings and private terraces. On the rooftop, stunning sunsets give way to star-filled skies. Budget savvy tourists will love the simple oceanfront Mayan cabanas and guest rooms at Luv Tulum. Rustic and fuss-free, spend the day watching the palm trees sway or dining on handmade artisan tacos at the on-site restaurant. Wining and dining is as much a part of a Tulum escape as salty hair and sandy feet. With so many options on offer, stick with these favourites for the ultimate combination of great food, stylish décor and good vibes. Any foodie who visits Tulum must head straight to Hartwood. Coveted for their speciality wood-fired cuisine created without electrical appliances, this open-air restaurant has a massive following, so be sure to get in early or chance missing out. perfection on the outdoor wood-fire oven. Visit on Thursdays for live music under the stars at the weekly Jungle Party. Blending Mexican cuisine with international influences, Arca channels a farm-to-table philosophy in dishes such as seared grouper with soft garlic and leeks, and suckling pig with pearl barley, smoked ham and charred jalapeño. Lush palms frame a medley of rustic indoor-outdoor tables as molten lights cast a glow over the chic raised bar, where killer cocktails are an attraction in their own right.When in Mexico it is only natural to lean towards local dishes, and nowhere does them better than El Tabano - make sure to try the deliciously spicy chilli poblano. Dinner and drinks go together at Casa Banana, where guests experience Argentine flavours through grilled meats and thirst-quenching cocktails. Sit outdoors under strings of glowing lanterns for the perfect romantic night out. A little Italian gem on the beach, Posada Margherita is a seductive mix of casual and cool. Match the awe-inspiring view with a plate of mouth-watering handmade pasta, and drift into a heavenly food coma. At Casa Jaguar, you’ll be surrounded by the lush jungle as you feast upon whole fish or tender steaks grilled to perfection on the outdoor wood-fire oven. Visit on Thursdays for live music under the stars at the weekly Jungle Party. As the day comes to an end, the party will just be getting started at the super trendy Gitano. Sip on mezcal tipples (Jungle Fever and Gitano Mojito are fail-proof), before taking to the dance floor for a night to remember–Tulum-style. EXPLORE ANCIENT RUINS: As the last city to be built and inhabited by the Mayans, Tulum is both a historic site and a tropical paradise, where wild, untamed landscapes reveal spectacular ancient ruins and secluded white sandy beaches. Don’t miss a visit to the spectacular Mayan ruins perched 12-meters high on the edge of Tulum’s dramatic limestone coastline, before heading down to the turquoise waters for a refreshing swim in the Caribbean Sea. One of Mexico’s most visited archaeological sites is the awe-inspiring ruins of Chichén Itzá, which were once one of the largest cities of the Mayan civilisation. Make sure to visit El Castillo, the imposing step pyramid which has dominated the site since its construction in the 1st century. Nestled in the middle of a dense tropical forest, the ancient ruins of Palenque are one of Mexico’s most dramatically situated archaeological sites. Exploration and reconstruction is still ongoing at this sit which was discovered in the late 18th century, where only 10% of the city has been uncovered to date. The site is home to several buildings, including the stunning Temple of Inscriptions, a 9-storey pyramid temple which encloses the sarcophagus of King Pakal. ACTION & ADVENTURE: One of the most stunning natural features of the Yucatan Peninsula is its vast range of natural cenotes, which form when ancient limestone bedrock collapses, leaving deep holes filled with water. Formerly the historic site of Mayan rituals, these beautiful pools offer the chance to snorkel, dive and swim surrounded by the region’s natural wilderness. Cenote Dive Center in Tulum offers a range of cave diving and snorkelling tours. Further afield, the small town of Akumal is a picturesque coastal hideaway originally founded as a base for scuba diving. In ancient Mayan, Akumal translates to the ‘place of the turtles’, hinting at the spawning turtles that arrive on Akumal’s coastline every May to lay their eggs. The clear, turquoise waters of the bay have also long attracted scuba divers, while the area is also ideal for sea kayaking and snorkelling due to its vast population of turtles, rays and colourful sea life. Nearby, Aktun-Chen Natural Park is the place to discover lush landscapes and wildlife. A diving and snorkelling paradise, the Island of Cozumel boasts stunning turquoise waters and pristine white sandy beaches. Organise a snorkelling or scuba diving trip to explore the technicolour coral reefs just off the coastline, or embark on a thrilling cave dive into ‘the devil’s throat’, a spiralling cavern that descends from 24 meters to 41 meters, offering an unforgettable experience for seasoned divers. FURTHER AFIELD: Surrounded by the turquoise waters of the Caribbean lies the remote and secluded Holbox Island, an island which spans 12 kilometres which is separated from the mainland by a shallow lagoon filled with pelicans and flamingos. Organise a kayak trek through the mysterious mangroves, horse ride on the white-sandy beaches, and dive with whale sharks, giant rays and dolphins. Also visit the imposing ball court where Mayan men played pok ta pok, a form of ancient basketball. A world heritage site since 1997, the city of Campeche still retains the imposing ancient fortifications designed to deter marauding pirates who once stalked the coastline. Explore the colourful houses and colonial architecture of this picturesque 16th-century town which is situated behind the city’s defensive walls. Head to the ruins of Calakmul or Ruta Becán for a glimpse of the Campeche region’s Mayan past. Listed among the most important Mayan sites in the world, the Uxmal Archaeological Zone marks the location of an ancient city where impressive temples and ornate friezes can still be found. A superb example of the Puuc style of Mayan architecture, the temples’ low, smooth walls give way to carvings of serpent heads, Mayan huts and masks of the gods. Extremely well preserved, Uxmal gives a true glimpse into the history of the Mayan civilisation. O T H E R T R A V E L I D E A S. . .